‘Ignorant,’ said James DeGale of Chris Eubank, 10 days before their grudge fight. ‘Can’t box,’ he followed up with, adding insult to verbal injury. ‘Hasn’t beaten any top fighter,’ said the first British Olympic champion to win a world title of the younger man threatening to terminate his career in the O2. ‘Delusional,’ he summed up Son of Eubank. Chunky was talking as fast as he was feinting the punches through the cold morning air with which he intends to teach Junior a boxing lesson. ‘Too ignorant to listen to his new trainer and learn,’ said DeGale of Eubank finally hiring a full-time head coach, Mayweather protege Nate Vasquez. ‘Not with the likes of me,’ is the two-time world super-middleweight champion’s judgement. ‘Just doesn’t have the skills. ‘Give him credit for having the heart, the guts and the strength conditioning to be able to mix with the best. But he doesn’t have the tools to beat us. Also why he is shifting away from his initial prediction, at 33, that this could be his last fight to saying: ‘I’m looking at another two years of bigger fights than this now I’ve put in the months of work to be sure I beat Eubank. ‘Compare our resumes. He’s lost his only two fights against top-flight opponents, Billy Joe Saunders and George Groves. ‘I beat Andre Dirrell in America to win my first IBF world title. I had that brutal draw with Badou Jack in New York in a unification fight to keep my belt. ‘I beat Lucian Bute over there.’ Eubank’s only claim to world honours thus far is the fringe IBO belt acquired against unrated New Zealander Renold Quinlan. 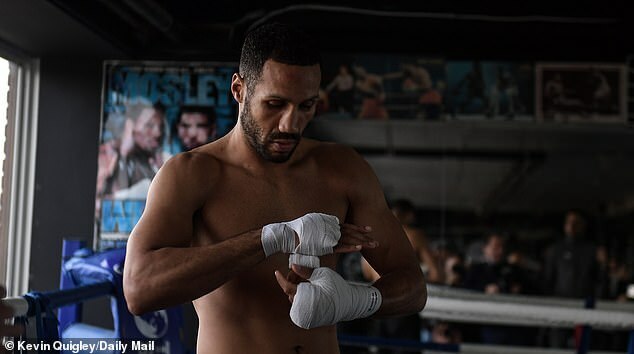 That now vacant title will be at stake at the O2 but DeGale says: ‘With all due respect to the IBO that’s not one of the four main world titles. ‘I’ll be happy to carry the belt around the ring at the end but it’s not what I’m fighting for. ‘After I beat Eubank I’m looking at fighting for a third world title. Possibly against Callum Smith. Al Haymon, the mysterious Svengali of US boxing, knew that when he made DeGale one of the first of his multi-million dollar signings. Says Chunky, raising his hands in prayer: ‘Thank God for Al. He’s not only the most powerful but also the most loyal man in boxing. ‘People questioned why I went to America but he’s got me my big fights – this one included – and my healthy bank account. More British fighters should sign with him.’ Eubank has already done just that. DeGale smiles and says: ‘That’s just Al covering his bases.’ So Chris Jr delusional? Says Chunky: ‘He and his dad kept saying he could beat Canelo [Alvarez] and [Gennady] Golovkin. Yes, delusional. ‘He says I will be weak and die in the fight because daughters of his friends keep seeing me out on the town drinking and I’m not dedicated.